In The Straight Beef Podcast #17, the following assertion was set forth: Hamburgers are by definition made of beef and served on a round bun. 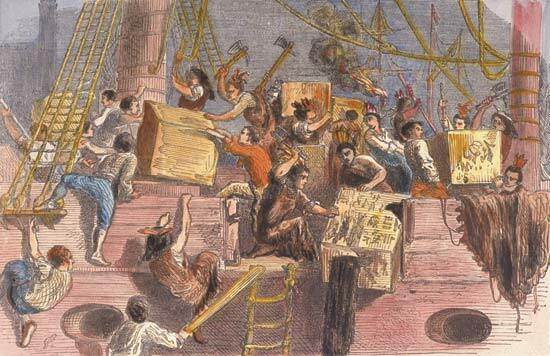 The controversy that followed was marked by a vitriol not seen in this land since badly miffed colonists dumped 342 chests of tea into Boston Harbor. I told you adding a veggie burger at White Castle would cause problems. In an effort to quell the threat of burgiatric revolution, three of our senior burgiatrists traveled to Town Hall Burgers and Beer in Durham for a formal debate on the matter. Argument was heated. Freedom Fries were thrown. What follows is an excerpt from that debate. Michael “Royal Governor” Marino was first. Moderator: Dr. Marino, state your burger. Marino: I had the Carolina Burger—an Angus beef patty, ground in-house, topped with fat back, pimento cheese, and cole slaw, served on a brioche bun. My fellow Americans, this was truly an all-American burger. A burger of freedom. Sure, the cook used this freedom to cook my patty medium well, though I ordered it medium—thus knocking my rating down to a 4.25—but I stand firmly behind his right to wield his spatula as he sees fit. Freedom, I say! Chad “John Quincy” Ward was next. Moderator: Mr. Ward, your position on what constitutes an “all-American” burger has historically been less traditional. Would you expand on that position within the context of your Town Hall burger review? Ward: I will indeed, sir. Ahem. MY. FELLOW. AMERICANS. If our fine land is to be considered the “great melting pot, ” which it is, and a nation that embraces its myriad cultures and traditions, which it does, then I submit that Town Hall’s Lamb Burger is as American as any round-bun mainstay. Yes, it replaces ketchup with tzatkiki sauce and a round bun with a pita-style bread, but clearly, my friends, this is still a hamburger. And while the usual sharp flavor of tzatkiki was in this case a little tame, my patty was perfectly cooked and flavorful. Even the staunchest burgiatric conservative would agree this that burger deserved a 4.0 out of 5. Statesman Donald “Reverend” Corey was third. Corey: Expound? I’ll give you expound, all right. Tzatkiki sauce? Pita bread? Brioche bun? What in the name of Uncle Sam doth mine eyes see? Clearly I am the only burgiatrist present today who recognizes a true American hamburger when he sees one, and the Town Hall Burger is it. The very description of the burger—topped with lettuce, tomato, red onions, grilled onions, bacon, eggs, and American cheese—had me waving my stars and stripes. But the proof was in the pudding. The over-easy egg broke perfectly with the first bite, showering the patty in golden sunshine. The beef was excellent in flavor and texture. And with a perfectly-toasted bun containing its glory, the Town Hall Burger’s greatness was clear from sea to shining sea. A 4.5 out of 5. Town Hall Burgers and Beer’s overall ranking: 14 out of 58.